“Diamonds are a girl’s best friend”, is a famous quote popularized by Marilyn Monroe, and yes quality diamonds do come with a longevity that is likely to outlast most human friendships. However, there are lots of counterfeit diamonds out there, and the last thing you’d want to do, is to spend extravagant amounts of money, thinking you’re getting an authentic diamond only to find out, weeks, months or even years later, that you’ve been sold a fake. When light passes through regular translucent or transparent stones or glass, the refraction rate is of a lower index than that of real diamonds. 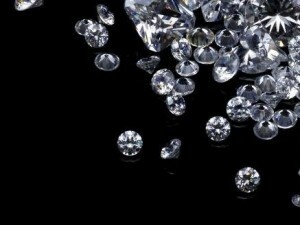 On real diamonds, it is powerful, on diamond the appearance is striking. This is a refraction test. How the light appears indicates the authenticity of the diamond. Another great way for spotting fake diamonds is the fog test. The same way mist would gather on a mirror when you blow air on it, you could do the same to the jewelry you intend to purchase and observe what happens next. If the fog goes away slowly then you've likely got a fake diamond in your hands, as authentic diamonds will, generally, repel the fog immediately. Authentic diamond bands, rings and other jewelry should carry a stamp that indicates their percentage quality. While forgers might be able to place fake stamps on fake jewelry, and thereby deceive the passive viewer, a more in-depth examination will reveal the quality of the metal on which the stamp is laid. Expensive diamonds should be placed on expensive metals so watch out for this. Every diamond purchase, should have a certificate of authenticity. Even if the diamonds you would like to buy come with one, you should still examine it carefully. There should be no errors such as blotched ink or typographical errors, and it should carry the trademark. Another way of knowing the authenticity of a diamond, is to do the magnifying glass test. If you have access to a microscopic machine or a jewelers loupe, take a look at the stone's crown. If the image appears blurry or doubled, then it is a fake. The edges of a real diamond are meant to appear rough and pointed. Perfectly rounded-looking diamonds are most likely to be fake. This is another method for testing diamonds. Use a lighter or a candle and heat the stone, and then drop in a cup or bowl of water; if its a fake diamond it will crack inside but a real diamond is stronger than that and will not crack. The diamonds should be dropped in water, fake diamonds will float or sink slowly before reaching the bottom, but real diamonds will sink immediately they get into that container because of its quality and density. However this is also not proof that its original, one should conduct as many tests to ensure it is the right one. Another test to know an authentic diamond from a fake diamond, is a reading test. To perform this test is to take a newspaper or book with clear visible words and take the stone and put it upside down on the paper and try to read the words, if you can read or see blurry words, then its fake. A real diamond would refract the light such that one wouldn't be able to read the words on the paper. You could also draw a dot on a piece of paper, and turn the stone upside down and attempt to view the dot. If it can be seen clearly, then you've got a fake diamond. If you are still in doubt, then it is important to have the jewelry you would like to buy, examined by a gemologist. It is also important to do your research online and look for authentic jewelry stores to help you with your query. Also, you should probably buy your diamonds from popular stores that are known for providing quality stones. They would be expensive, but at least you know what you are buying.